Placing a Buddha statue in your home can attract positive chi energy. Buddha statues are a popular feng shui item. There are a few hard and fast feng shui rules you want to follow so as not to offend the Buddha. Be sure to follow these instructions and you'll soon reap the blessings of a grateful feng shui Buddha. Place a Buddha at a height that is at least eye level. Looking down at a deity is considered rude and irreverent. Avoid placing near electrical outlets or equipment with moving parts and motors. This type of activity disturbs the surrounding energy. When placing a Buddha statue or any statue of a deity make sure the location is truly one of reverence. This means you should never place a buddha in a bedroom, bathroom or kitchen. Many feng shui consultants recommend placing the Buddha opposite the main front door of a home on a table that is about 30 inches high. This location allows Buddha to interact with the chi energy entering your home. From this position, the statue can neutralize any negative chi, and transform it from damaging to very lucky energy. Buddha is also quite comfortable in the living room. The best position for Buddha in the living room is facing the front door. Students should place Buddha on their desks. This is a perfect location to enlist a little help with lessons and evoke Buddha auspicious energy for fulfilling your academic goals. For those that own a business, placing Buddha on a reception's desk can help bring prosperity to your company. You can also place Buddha on an office table. A mediation garden is an ideal area for a Buddha statue. One of the most popular poses is the Meditation Buddha. If you're Buddhist, then you probably already have an altar; just make sure you place this altar in your home where meditation and reflection can be practiced. If you practice yoga, then you have a special room or area of a room in your home devote to your exercise. This is an excellent place for a Buddha statue. Just be sure to place it eye level or higher. While feng shui experts may differ on the best location for a Buddha statue, one thing they all agree about is that the laughing Buddha statue makes a wonderful addition to any home! It can be difficult to feng shui your life, but purchasing a laughing Buddha is one of the easier aspects of using this form of interior design. This particular Buddha represents both happiness and wealth. Legend has it that he likes nothing better than coming into your home to smile away all troubles. This Buddha is also nicknamed the happiness Buddha. Jolly and happy, this particular Buddha is like the Santa Claus of the universe; he's round, content and in feng shui, he comes bearing gifts! The next time you visit a Chinese restaurant, look around; the chances are good that you'll see this happy fellow, smiling contently beside the cash register or a special place overlooking the entrance. The most popular statue is of the Money Bags Traveling Buddha. Among his valuable possessions as he wanders about it the country is a Wu Lou. This hourglass-shaped gourd is the bearer of healing, long life and overall good health. The ideal placement is the east (health) sector. You can also place it in the east to boost the eldest son's all-around luck and prospects. This statue is known as the Standing Buddha or Jolly Hotei and is often placed in the north (career) or southeast (wealth) sector. You can also place it in the East sector attract so you are rich in health luck. This laughing Buddha features five children climbing all over the happy Buddha. This is a favorite for anyone wishing to imbue this love for children and childish play in a specific area of life. An obvious placement is the west (descendent's luck) sector to bring happiness and wealth luck to your children. You can also place this Buddha in the health sector (east) to attract health luck for your family. Bigger is better: It really is better to try to find the biggest Buddha possible. If that isn't possible, a smaller sized one will still work. It just won't have as big of a power bunch. Try a laughing Buddha first: There are many Buddhas available, but if this is your first purchase, start with the Laughing Buddha. The Laughing Buddha is also known as the Buddha of Wealth or the Buddha of Happiness. Who wouldn't like a little more of both? Look for the symbols: The Laughing Buddha is usually depicted carrying certain items, such as a pot of gold, large ingots or a sack filled with treasures. Other symbols include a "wu lou" (gourd with a red ribbon), a symbol of good health and longevity. Whenever you place any object in your home for a feng shui symbol or remedy, be sure you use the right element. 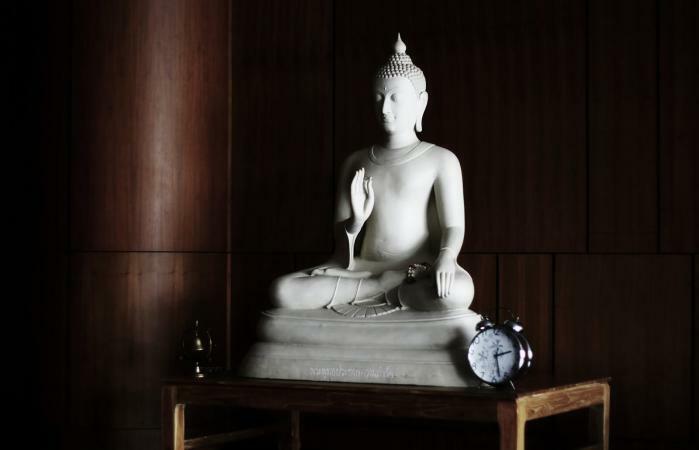 For example, a metal Buddha placed in the northern sector of your home is typically an outstanding choice for location. The same statue placed in the east sector of your home won't have beneficial results. In fact, metal in a wood element sector can impede your feng shui design since metal cuts wood. Avoid putting a Buddha statue on the floor; this is deemed very disrespectful. 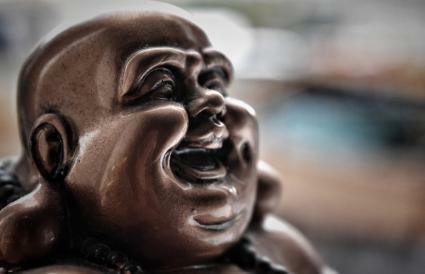 If you opt for a Laughing Buddha, don't forget to rub his belly. While this isn't a requirement, many people claim that rubbing Buddha's belly every day (the fatter the belly the better) will bring luck and prosperity to all in the home.